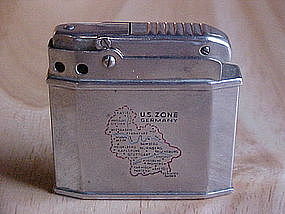 Super late 1940's German cigarette lighter featuring an engraved Map of US Zone Germany. It is signed on base " Augusta Automatic ". 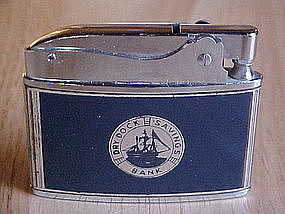 This lighter is in fine condition and measures 1 13/16" wide and 1 11/16" high. 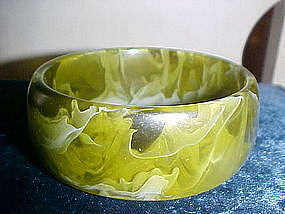 Fabulous 1950's vintage large lucite bangle. This bracelet is gorgeous!!! It is of lime green with incased smokey design. 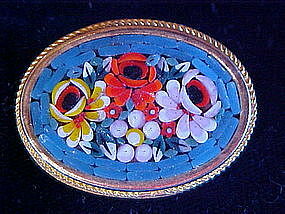 This beauty is 3 1/4" in diameter and 1 1/4" wide and is in Excellent condition. HAVE A LOOK AT THE PICTURES!!! 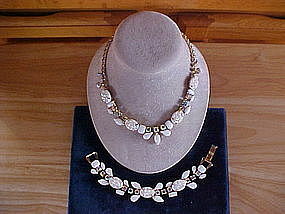 Vintage 1950's pendant and original chain. Made in GERMANY. This pendant features a large art glass cabochon stone with 6 aurora borealis rhinestones framing its base. 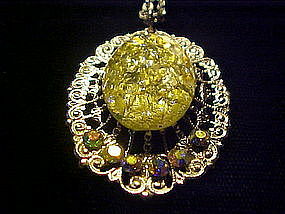 The pendant measures 1 3/4" long and 1 1/4" wide. 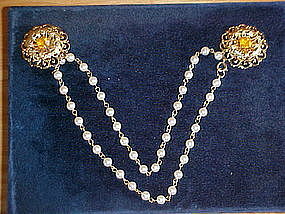 The chain measures 18" long and its clasp is marked " GERMANY." This wonderful pendant is in excellent condition and quite stunning!!! 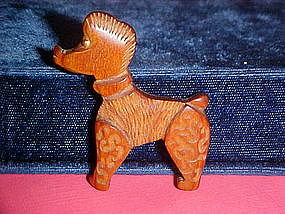 Beautiful vintage 1930's-40's hand carved wood poodle brooch. 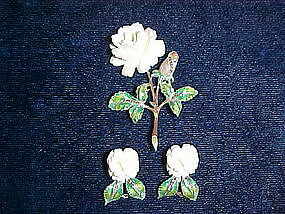 This wonderful pin is carved in the bakelite style of the period. I believe this wood to be rose wood or cherry. The dog has a brass rivet eye and measures about 2" long and 2 1/4" high and is in excellent condition. Beautiful 1950's heavy weighted MONET bracelet. This bracelet has 18 sculptured links with each length featuring 3 ornate rods. It measures 7 1/4" long and 1 2/16" wide and is signed both in the clasp and a hanging plaque from its safety chain " MONET." 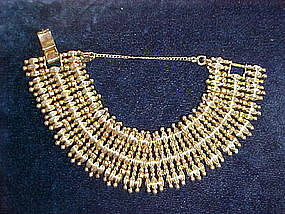 It is in excellent condition and has a realistic resemblance of a heavy gold bracelet!!! With the price of gold now please be careful when wearing this beautiful creation because it sure looks like solid gold!!! 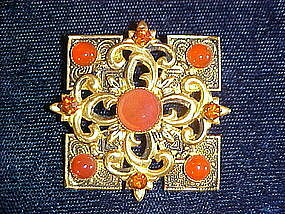 Nice vintage ladies brooch consisting of faux cornelian and prong set orange rhinestones from 1950's-60's. This lovely pin is made from a gold toned metal and is in very fine condition. It measures 1 7/16" x 1 7/16". Beautiful 1960's signed WEISS brooch. 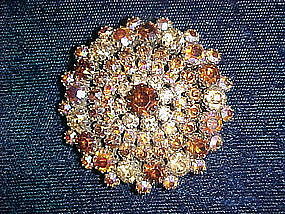 This pin features pronged aurora borealis and brown autumn color chaton rhinestones. 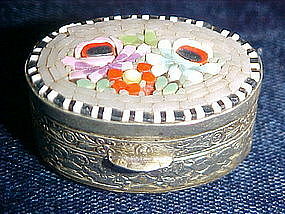 It measures 2" in diameter and it is in extra fine condition. 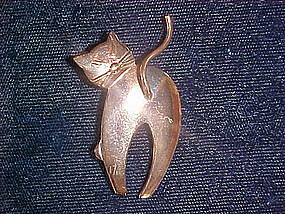 Cute vintage copper cat pin from 1950's. This stylized cat measures 2" long and is in fine condition. Fabulous Monet pin in the form of a Fly. 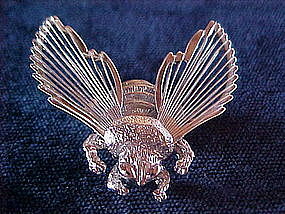 It is made of a silver tone metal and has a cut out wings. 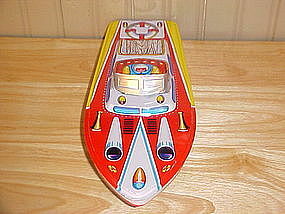 It is in Excellent condition and measures 1 1/2" long. Cute 1970's pin featuring a owl perched on a branch. 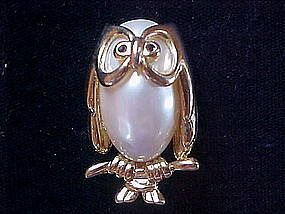 The owl is made up of a large faux mobe pearl framed in a gold toned body with two black faceted black glass rhinestones for its eyes. This pin measures 1 1/2" long and is in perfect condition. 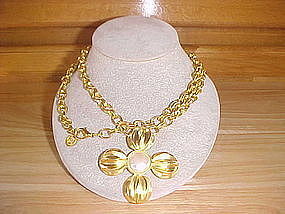 Super 1970's-80's large flower pendant with original chain by " Givenchy." If you like Big and Heavy designer Jewelry this piece is for you!!! It features a well weighted 4 petal flower with a faux pearl center that measures 2 1/2" long on original double link chain that measures 35" long. Both pendant and chain are signed " Givenchy." In Superb condition!!! A Real Show Stopper!!! !